Releasing terrorists is good, but approving new Jewish construction in Jerusalem is wrong, according to the head of the United Nations. 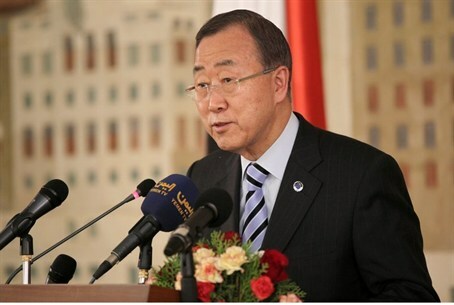 Secretary General Ban Ki-moon, in a statement he released on Wednesday, condemned Israel’s announcement that it will build 1,500 new housing units in the Jerusalem neighborhood of Ramat Shlomo. “Settlement activity is contrary to international law and constitutes an obstacle to peace. Any measures that prejudge final status issues will not be recognized by the international community,” said the statement. Ban then expressed “appreciation” for Israel’s decision to release terrorists who murdered Israelis as a “gesture” to the Palestinian Authority. Israel’s announcement that it will promote new construction in Ramat Shlomo came on Tuesday night, as 26 terrorists were being released, the second in a series of four releases. The plan to build 1,500 homes has been shelved and then revived several times over the past few years, largely because of criticism over it by the United States.